I was so impressed with how well the swish & swipe worked in the bathroom that I found a way to use it in every room. Now, as I go into each room in the morning or afternoon, I think S&S.While I’m waiting for my breakfast to be ready I wipe down the microwave, toaster oven, and the fridge, dust mop the kitchen floor (I have 2 cats & a dog). By this time my breakfast is ready and the cats have finished theirs. I put my breakfast on the table and then start at one end of the kitchen and use a damp dust mop and breeze through the kitchen. Of course my sink, stove and counter were done last night. Next after eating my breakfast, I use the feather duster in my dining room and make sure there are no crumbs on the table, take my dishes to the kitchen and put them in hot soapy water. Next on to the bathroom with the regular S&S there (I always add wet mopping there each day); then I move on to my family room and living room. I use the feather duster each day and it takes me a total of about 10 minutes each morning. I also have a small vacuum that I run just in the middles. I also spray Febreze and hit the hot spots in each room. Back to the kitchen and wash my dishes and pack my lunch which was made the night before. This is all a part of my morning routine. My dear hubby is always asleep when I go to work, so my top floor waits for my afternoon routine, but, he has started (on his own) to make the bed when he gets up. When I get home, I dust the upstairs bedrooms and run the small vacuum and then S&S the upstairs bathroom. My evening routine includes making my lunch for the next day (even if I’m staying home) dishes, stove, counters and shine my sink. About 1x per week, I do heavy vacuuming and make sure everything is where it belongs. Usually this is done on Saturday. It takes less than a half hour each Saturday, so it doesn’t cut into my free time. No, I don’t have kids at home anymore, but I’m a pre-school teacher so I’m around them each day, I have always been an early riser and I just love doing this in the morning and after I get home from work, so I can do what I choose to with my evenings. I also don’t have a mess hanging over my head all week which makes me very cranky. Thanks for all you do; now to just get my daughter to realize her house could be like this too, but she has to figure this out for herself. I was not a very good role model, but am now. By the way, I did NOT start with a clean house, I just added a little work to each room each day and before I knew it, it was company ready each day. Its almost like fairies came in and did the work. FlyLady here: I love this. Every room can be Swished and Swiped. In the bathroom it takes less than a minute to keep your bathroom clean and shiny! Let’s do one minute in each room and see what we can get done with Swish and Swipe! Our Feather Duster, Purple Rag, and Mop make Swish and Swipe easy in every room in your house. We have a new feather duster that can reach those high places. Sometimes you just need something fun! We love our tools too! If you make it fun, it will get done! Who ever dreamed that a toilet bowl brush could be fun? We did! Swish and Swipe just sounds fun doesn’t it! Swish and Swipe is our new habit for July! 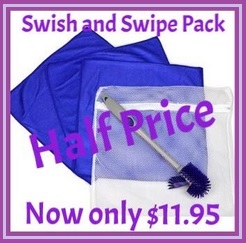 We have the Swish and Swipe pack half price! This entry was posted in testimonials and tagged duster, flylady, Sink Reflections, swish and swipe. Bookmark the permalink.